Wonder Dryer Balls are a natural energy saving health product for your clothes dryer! 1. Energy savings because of reduced drying time. 2. Ironing alternatives. (See instructions below). 4. Reduced static cling on all natural fiber fabrics (i.e. less friction between clothing). 5. Softening for your laundry. 7. Non-toxic for use around small children and pets. 8. Hypo-allergenic for skin sensitive people. 9. Colorfast on all fabrics. 11. ENGINEERED FOR A LIFETIME. Use both of the "WONDER DRYER BALLS" in the dryer so they can work together. Place them in dryer along with your damp load of laundry and leave them there for each and every load. Important, do not overload the dryer and do clean your lint filter every time you use it. Start the dryer at your desired heat setting. (A higher heat setting for anything but delicate items is actually better). As the dryer drum turns, the "WONDER DRYER BALLS" retain the heat with the little "nubs" on the ball begin to lift and separate your damp clothing while evenly pushing hot air through them. All fabrics dry faster and soften "naturally". 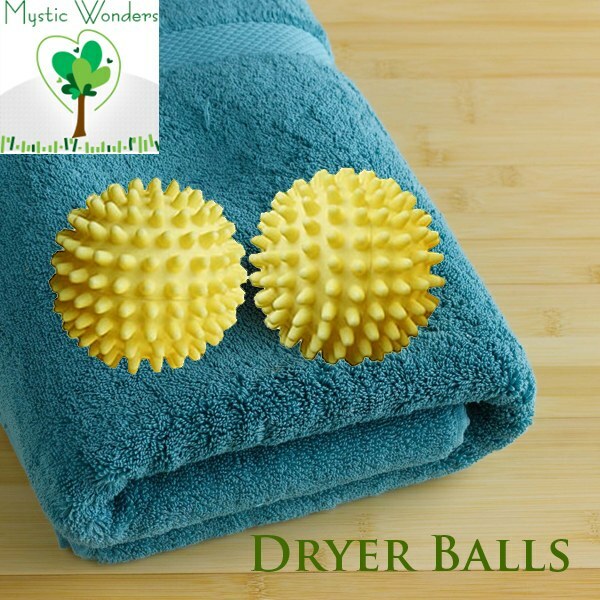 All you need to do laundry is the WONDER BALL from Mystic Wonders Inc.com for your washing machine and the " WONDER DRYER BALLS" for your clothes dryer. Take any items that are clean and dry but have wrinkles, and put them in the dryer. Turn the dryer on at the highest heat setting your garments will tolerate for approximately 10 minutes. Remove them before the dryer stops and place on a hanger to cool off. The wrinkles will be gone. When you don&apos;t want to iron again use the "WONDER DRYER BALLS". You will see great results!